Your roof is the first line of defence, protecting your home and contents from the elements with regular roof maintenance inspections year after year. It is important that you have a trusted roofing company keep an eye on your roof for signs of wear and damage so you can make a repair before expensive damage is caused. 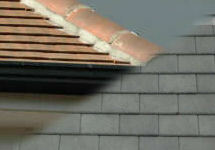 Just a broken tile or two can allow strong winds to lift your whole roof off! Quite often, the first thing you know about a loose ridge tile is when it lands in your garden or on the bonnet of your car in your drive as soon as the wind gets up. Wintertime and a good storm very often reveal damage that has occurred previously. All it takes is a strong gust of wind to get under loose slates or tiles and large sections of your roof can come crashing down to earth, causing even more damage than to just the roof itself. One of the most common areas in need of roof maintenance is the cement flashing around chimneys and brickwork. Once moisture permeates the cement it will soon breakdown following a few frosts and heavy rain. Guttering and fascias can also cause problems to your roof. If fascias are not maintained they will rot, causing truss damage which is costly to repair. Annual roof maintenance inspections can highlight potential roof issues saving larger repair bills in the future. Small levels of roof maintenance by your local roofer can protect you from large re-roofing bills later on. A well maintained roof will last for decades, a roof left to rot will cost you much more in the long term.